In October 2005, Wal-Mart CEO Lee Scott outlined an ambitious vision for the future operations of the company focusing on becoming a good steward of the environment and local communities. He announced that the company’s long term environmental goals are: 1. To be supplied 100 percent by renewable energy; 2. To create zero waste; and 3. To sell products that sustain our resources and environment. Short term goals included eliminating 30 percent of the energy used by stores. Since then, Wal-Mart engineers have worked diligently to identify areas for potential energy savings. They have collaborated with suppliers to innovate solutions, tested new technologies and finalized proven designs to implement in corporate facilities. One store system designated for an efficiency upgrade was the fluorescent lighting in refrigerated food cases, which burns 24 hours a day. Recently, LED lighting coupled with occupancy sensing controls was proven to provide the combination of energy savings, improved performance and reduced maintenance to justify incorporating a new design for refrigerator and freezer case lighting and controls into plans for all new stores. Because the energy savings are so significant, a program is also underway to retrofit cases in over 450 existing stores in 2007. 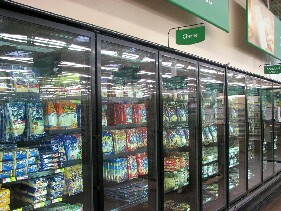 During fall 2006 new LED display lighting controlled by Watt Stopper occupancy sensors was installed in all the refrigerated cases in two test stores near Wal-Mart corporate headquarters; one in Jane, Missouri and one in Rogers, Arkansas. By detecting motion in the store aisles, the sensors turn case lights on as the customer approaches. The lights are turned off soon after customers leave the buying zone. Occupancy sensors above these refrigerated case doors switch case lighting on only when needed. Products are illuminated by LED lighting which contains no environmentally harmful mercury. Wal-Mart Senior Engineer Ralph Williams, P.E. was in charge of the project and describes the many benefits of the system noting, “Unlike fluorescent lights, LEDs can be switched on and off in cold temperatures without any loss of life expectancy. In fact, turning them off will increase the lifespan of the LEDs so that the service life of the lighting will be as long as that of the refrigerated cases themselves, virtually eliminating the need for maintenance.” Williams explained that fluorescent lighting in refrigerated cases is very high maintenance due to condensation and resulting corrosion of contacts in the lamp holders. To maximize energy savings and LED life, the time delay for the sensors was set to the minimum of 30 seconds. Data loggers were installed in both stores to record actual on and off times over the course of six weeks and showed that the case lights remained off 44 percent of the time in the Jane store and 47 percent of the time in the Rogers store. From this experiment, Williams confidently concluded that the company could realistically expect LED case lighting to be off in excess of 40 percent of the time by installing sensors. When examining the total energy savings for the project, the picture became even rosier. Because the LEDs use far less power than fluorescents, the connected load was reduced by 43 percent. And since the LEDs generate less heat than fluorescents, and no heat when turned off by the sensors, the compressors are not required to run as often to chill the cases using the new lighting. The overall energy savings realized by changing from uncontrolled T8 fluorescent lighting to occupancy sensor controlled LED lighting turned out to be 92 percent. These incremental savings represent close to three percent of the total energy usage of the entire supercenter store. By making this one change, Williams was ten percent of the way to the corporate goal of achieving 30 percent energy savings. 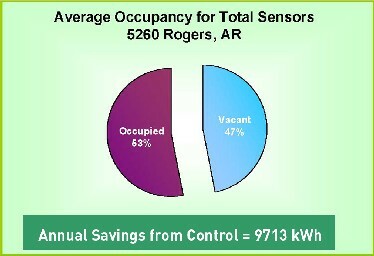 The combined savings of sensor control and LED lighting resulted in 92% energy savings compared to uncontrolled fluorescent lighting. The savings include reduced refrigeration compressor energy due to less heat, a benefit of using both LEDs and sensors. The typical Wal-Mart grocery includes a substantial number of refrigerator and freezer case doors, so replacing this amount of lighting in over 450 stores per year is a significant investment, but it’s also an investment that will show a good return. The cost of replacing the fluorescent lighting with LEDs with sensor controls will be paid back in approximately two years. The facilities will also benefit from reduced maintenance costs over the life of the systems. 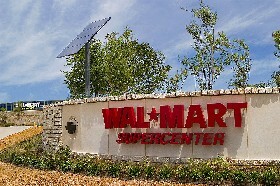 Environmental benefits, too, are in line with Wal-Mart’s stated goals. Reducing energy use lowers greenhouse gas emissions, and the move away from fluorescent tubes, containing materials requiring special disposal, are both positive steps toward sustainability. The LEDs contain no mercury and no glass. Even their long life has a secondary contribution by eliminating the need to transport replacements. Watt Stopper has previously supplied sensors for Wal-Mart distribution centers and is proud that its products have been specified for this nationwide upgrade. Ralph Williams expresses confidence in the company saying, “Wal-Mart has worked with Watt Stopper on other corporate initiatives. Watt Stopper provided a solution and great support.” Watt Stopper personnel look forward to continuing to work with Wal-Mart to innovate energy saving solutions for future projects. For more information about Watt Stopper/Legrand, visit www.wattstopper.com.